If you care about the poor and starving, drive your car, then sell it and buy a bigger car, drive across your nearest continent. Then do it all again. Before the world shifts to nuclear power (which it surely will) get that plant fertilizer out of the ground. From America’s Heartland, if we get enough rain, hot temperatures within historic ranges don’t really do much. Going cold too quickly, now that’s a different story. Going cold too quickly, now that’s a different story. … especially when that happens at the wrong time, like just when newly planted food crops are budding, or setting fruit, or just before harvest when everything is ripening. Cold damage at those times can be a real disaster. But for warming to threaten our food? Que? As usual, the Grauniad is off on the wrong tangent. Their writing staff are educational system failures and intellectual vacuums. Having any science education at all seems to be a severe impediment to employment with them. Anyone who has even a smattering of science education should know that warmth accelerates, speeds up, increases, hurries along, improves and motivates all chemical reactions. All life forms, including and especially plants, are chemical factories. Warm ‘em, feed ‘em, water them and watch them grow. Cold does the opposite. If you buy batteries in bulk to take advantage of the occasional specials as I do, then store all your surplus batteries in the bottom of your refrigerator. Batteries have a `shelf life’ of three to five years `at room temperature.’ Batteries develop charge from a chemical reaction. Slow that reaction right down by refigerating them, and they last for ages. It almost completely stops at 4° C. So don’t store them at room temperature. I haven’t bought any batteries for nearly ten years. I’m still working through the ones in my fridge. I have no idea how long they will last. My cold hoard is sort of an experiment. Most of them are about to make ten years old or will be in the coming January so that’s not bad. The majority are just standard AA and AAA cells. Auckland had a very wet but not a particularly cold winter over the last six months. I have a little mandarin tree I planted in 2010 and watched the 2011/2012 summer drought kill. Or so I thought. I forgot to water it. As you can tell, I don’t have green thumbs, brown ones maybe, but not green. It struggled back and this winter it literally doubled its height and foliage. Time to give the determined little thing some TLC. The Grauniad needs its nose rubbed in facts like that. Hard. It’s writing is otherwise spectacularly devoid of facts and overwhelmingly bloated with fictions. At one stage I wondered if they had declared war on science and reason. Maybe. …it is in a review of Mr. Bentham’s Traités de Legislation (Vol. iv. ), that the most elaborate attempt is made to erect sentimentality into a system, to clothe it in the garb of philosophy, and to support it by arguments having the semblance of being drawn from the principles of human nature. p160	- Defenders of Eyre extolled sentiment above reason, inc all the major poets of the day. Some people are willing to destroy everything based on reason in order to satisfy their sentiment. During the 20C this sentimental approach took humanity down paths littered with dead. Yes it was interesting that the Literary establishment lined up to support Eyre whereas the then scientific community were largely against him. Looking back my opinion (for what little it is worth) was that Eyre committed judicial murder; not that there was much justicel in having someone not involved in the riots being arrested on a trumped up charge, transported to the area controlled by Courts Martial and having him hanged forthwith. But Eyre was acquitted and (after some delay) got his expenses (for his trials) paid by the UK Government. Been storing my various batteries for torches and watches and numerous other battery powered items in the fridge, not the deep freeze, for close to 20 years now. I know some of them have been there for close on ten hears and when I get around to using them, they still seem to have a very good life and performance. The other item is the silastic sealants and adhesives in the cyclinders that come with those cheap plastic scew on nozzles. A couple of tubes of that get pulled out of their possie in the bottom shelf of the fridge door quite regularly to do small jobs over the last five years and as long as I am prepared to throw away the cheap plastic nozzle each time when they become blocked with hard adhesive , the adhesives and silastics in the tubes are still quite soft and ductile and are quite useable with no apparent loss of adhesiveness or sealant qualities. my fridge is a bit full at the moment! Bad Luck, I don’t drink beer. I just have never taken to the taste of beer and often wondered why I was different to all the others . Never drank until I was in my mid 30′s from choice. And I could still had a damn good time without alcohol. Staying away from the grog was about the only thing that kept me alive the way I use to drive our utes and cars. At 79 years a glass of a good preservative such as a good Port goes down rather well each night nowadays. Snowy Gramp on being interviewed after his 91st birthday was asked “what was the secret of a long life”. He said that when he was young all the old fellows advised him that sitting down with a glass (or two) of port after dinner and thinking about the days setbacks and disappointments was the key, Slowly sip the port, and review what has happened, and realise how little it really matters, and go to bed and sleep soundly and you would live a long life. Snowy “I don’t know, I’m only 91″. I drink but very little. I found in my late teens that alcohol in any but the smallest quantity made me seriously ill. That was after trying it only three times. I looked as though I were jaundiced for several days afterwards. I felt even worse. So I have left it mostly alone ever since then. One of the local breweries made a (very) low alcohol beer for a few years, I tried that and quite enjoyed it but it didn’t get much market share (no prizes for guessing why) and it disappeared. That was a very long time ago and, apart from a can of Fosters in a Melbourne pub in 1991, all I have had since then is an occasional good single malt. It’s a treat. A bottle of that lasts me years. I think I’m half way through my fourth bottle. That’s since 1980 and I should finish it sometime in 2020. I’ve always ridden large motorcycles and alcohol and riding never mix. CO2 is good for the planet and us. There is lots of proof of the improvements in the biosphere as the CO2 content rises. There is however no proof that driving my car across Montana has any effect on the atmospheric content of CO2. There just is no correlation between emissions and atmospheric content. That content is controlled by other natural forces so Jo’s tongue in cheek admonition to drive more to grow more sits on shaky grounds just as the activist’s dirge that if you drive more you kill more yet unborn babies. Activists are enabling the last one quite effectively, which often aligns with their Malthusian fears of people in general. All plants are made from CO2. CO2 + H2O + sunlight = carbohydrate(CO2)m(H2O)n. Why anyone would think more CO2 was a problem for any plant has no understanding of the basic chemistry which is responsible for all life on earth. No life would exist without CO2. I suspect that most Greens have no idea that trees, all plants are made entirely from CO2 and eventually form coal and oil. The terroir is only good for trace elements and a source of water and to anchor the tree. There is no big hole around a tree. Rather the tree lifts the ground. The Green hatred of CO2 and coal is beyond illogical. In fact Green itself, chlorophyll is just a long chain hydrocarbon. So in the amazing Ecopolypse science, CO2 is supposed to end life on earth. How is beyond reason. Scientology makes more sense. Life loves CO2 and warmth and promotes life. ‘Weather’ is entirely about H2O. Clearly water is the real industrial pollutant. We should be sequestering water from combustion, burying it deep in the planet. Or freezing it and dumping it on Antarctica. Or we could start trying to lower the sea levels ourselves. We could use windmills. Its strange how people can hold such strong beliefs originating from a poorly constructed hypothesis that has an answer easily backed from empirical observations from many facets of science. At some point the sane have to accept others become insane when politics infect reason truth is ground zero and the pathological are lies. I guess the question is did Pol Pot start as a madman with political clout? Hitler certaily did. This is why I am wary of how much traction the greenist climate chnage fantasy achieves, as history tells us politics can literally turn murderous, when gullible people are hyped up into hysteria…. So far it hasn’t created any overt dislike or disapproval. Love it! I think I might get one of those sheets of iron on transfers, create that logo and iron it onto a nice white T-shirt. What a great idea. What about “Glacial advance and cooling in the late 17th century killed millions of people and all I got was this lousy tee-shirt”? Could the lack of negative responses be due to the possibility that the green folk don’t know what the acronym means? Where and when green folk are involved, I guess anything can happen. Your point just hadn’t occurred to me. I would have thought it unlikely especially considering the 2 is properly subscripted. Anything is possible. Just try explaining the simple concept of the tiny amount of atmospheric human-induced CO2 to folks, even in terms they can understand, and watch their eyes glaze over. TdeF, what nice and short summary. CO2 is not fertilizer it is the essential ingredient (along with sunlight, water, nitrogen, and other fertilizing elements) of plant life which in turn supports all life on earth. Ask someone on the left/green what makes our life on earth possible and they will either lie of be clueless. Good job! One of my favorite musings from The Chiefio. At the coldest part of the previous glaciation, about 20,000 year ago, CO2′s atmospheric concentration supposedly dropped to around 190ppm. That is so close to complete and total wipe out. We don’t know how lucky we are. I live in Wonthaggi on the coast in South Gippsland, very flat bit that gets soggy in the wet, water from were I live takes a month to exit into the ocean only about 20Km from here by a pissy little river. I live opposite farm land that is slightly lower than me that gets some serious puddles/lakes in heavy rain. The farm land is being developed for housing and they are digging what I would call a meandering river about 50Ft wide and 15Ft deep to drain the place. It had about 1Ft of top soil 6 Ft of sand stone then clay, I meandered over there after our recent rain and the sand stone had just fallen apart into sand at the bottom of the river perfect beach sand. The sand stone is recent and I think my place was not long ago beach front property. sophocles sometime between your 20,000 years ago and now I had a very desirable property. I’ve driven through South Gippsland once. At least I think it was South Gippsland. It was so flat, I couldn’t tell. I didn’t see much and I know almost zero about it. What little I remember of it was flat flat … flat … more flat… still flat … flat It was so interesting all the passengers in the car in front had fallen asleep. I don’t feel at all jealous of you. Nature gives and the darned B-x-x-x-h takes away, sometimes without warning, sometimes with so much warning you’re left wondering why you never paid attention to it. I bet you have a really good pair of gumboots? Ta, TdeF, a new word. I’ve seen a few words in my time – never seen that one, though. An estimate of the centennial variability of global temperatures. Lloyd PJ (2015) Energy & Environment · Vol. 26, No. 3. Holocene records up to 8000 years before present, from several ice cores were examined. The differences in temperatures between all records which are approximately a century apart were determined, after any trends in the data had been removed. The differences were close to normally distributed. The average standard deviation of temperature was 0.98 ± 0.27C. Christy, J.R. and McNider, R.T. Asia-Pac. J. Atmos. Sci., 53(4), 511-518. The current adjusted trend is +0.096 K/dec [my insert - 0.96K/century] essentially the same value we determined in 1994 (+0.09 K/dec , Christy and McNider, 1994) using only 15 years of data. (ΔT at the time CO2 doubles) is +1.10 ± 0.26 K which is about half of the average of the IPCC AR5 climate models of 2.31 ± 0.20 K.
Business as usual. Natural variation without any discernible anthropogenic signal. Settled politics masquerading as settled science. It could also be considered that any discernible anthropogenic signal is simply noise given the short time period compared to 8000 years. Ummm YS, if that were the case then what evidence exists for labelling it ‘anthropogenic’ (land usage and atmospheric composition aka. defined UNFCCC “climate change”) in the first instance? How else for AlGore, JimHanson to blaime all ills on Coal Componies? Don’ forget the Catastrophic :	disastrous, calamitous, cataclysmic, apocalyptic, ruinous, tragic, fatal, dire, awful, terrible, dreadful, et cetera! What has to be feared with wheat supplies is the rebound effect of a good season. The bust that comes after the boom. “Learned” people constantly cite The Law of Supply and Demand, then go on to demonstrate that they have little if any comprehension of either supply or demand. If a good season produces an oversupply of wheat, prices fall. Not only do prices fall, but access to markets is not available to all suppliers. The result is that some suppliers do not have the capital needed to plant next year’s crop, and a lot of suppliers, often on advice from their financiers, withdraw from wheat production because of the low price. The next development can be that a poor season on the reduced acreage can cause a serious shortage. if you read the production line on the graph in Jo’s post you will see that the “dips” in the production graph are always exceeded by the stocks available as shown in the “stock” histogram. The excess stocks help govern price and meet demand. As efficiencies continue to reduce the costs of production, distribution and storage, supply increases making the price to the end-user lower and hence more affordable. That’s what accounts for the dramatic reduction in World hunger and undernourishment. It’s the Malthusian green-left and the eugenicists who wish to see that progress halted. I suspect mainly due to China modernizing their farming systems. 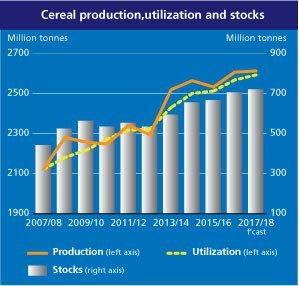 According to World-Grain.com Russia is on track to harvest its largest grain crop, with forecasts calling for total grain output of more than 128 million tonnes. I bet anyone named Lysenko isn’t allowed anywhere near their Department of Agriculture. Increased water moisture (H2O is the largest greenhouse gas) and cooler weather has produced an average crop in West Oz. ‘GIWA oilseeds council chairman and author of the latest GIWA crop report, Michael Lamond, said with the exception of the north and north eastern Wheatbelt, the 2017 harvest was now shaping up to achieve average results, rather than ordinary. ‘He attributed the improvement to late September rains and mild temperatures throughout October which had resulted in a favourable end to the growing season and many crops harvested to date yielding “better than they look”. I’m hoping this 2017 reply shapes up to achieve average results, rather than ordinary. The phrase greenhouse gas remains but a conceptual scam (no science). H2O if remaining an atmospheric gas would have little effect. It is only the huge (2,500 J/g) continual atmospheric latent heat conversion from insolation, early morning-mid afternoon (evaporation from cloud); with the continual reversible process (condensation back to cloud), then radiant exitance of the produced sensible heat to space; that produces all of the stored atmospheric power (energy) in Earth’s atmosphere. Academic meteorologists have no clue. No greenhouse anything. High time to flush all CAGW-BS! Not picking on you. To clarify; The mass of Earth, oceans, atmosphere have sensible heat (SH) average 2 J/(gm-Δk), but very little of that mass changes temperature (Δk) for storage of power as SH energy, oceans included. OTOH in Earth’s atmosphere there remains an average of 2 x 10^19 gm of airborne H2O in various phases of H2O. This is nine days of global precipitation. Such cannot remain gaseous as most of Earth’s atmosphere is way to cold. Why does it remain airborne; moving from place to place, what is it doing? Please consider #7.2 above. What a magnificent Planet! A hundred seconds of backup power…or it’s free! So it now seems that 30MW of the battery may be reserved to backup the (nameplate) Hornsdale 315MW wind farm.? If this is correct, this doesn’t seem like much of a backup. I thought he agenda of the left, in particular the Greens, is to burn less oil to solve the so called man-made climate change problem by culling off a large % of the world’s population. Why would the Greens ever agree to increase food supplies by whatever means to speed up the population growth? And burn more coal to feed the world? Not in Australia. Just ran a comparison of fossil energy sources for electricity generation per Anero.id website for AEMO grid. Nov 2016: Fossil fuels produced on average 19,000 MW, of which about 2,000 MW came from gas/diesel. Avge Vic wholesale price $36/MWhr, SA $62/MWhr, Qld $69/MWhr. Hazelwood coal station in Vic, nameplate capacity 1600 MW, closed in March 2017. Nov 2017: Fossil fuels produced on average 19,000 MW, of which about 3,500 MW came from gas/diesel. Avge Vic wholesale price $96/Mwhr, SA $91/KWhr, Qld $65/MWhr. So Australia is burning less coal, using more natural gas, driving up electricity prices and sending more industry offshore to save the planet? It’s a lot worse than that. A LOT WORSE! We are the only country of any significance in the world that’s not building more coal fired power stations. Many hundreds are built everywhere with many hundreds more on the drawing board. For some strange reason we are different. It’s as though we as a nation, not just the politicians, have decided to commit economic suicide. I haven’t figure out the exact reason as yet but one day it will make interesting reading. Or to put it another way, the only limits to massive plant growth are CO2, H2O and sunshine. If you have more of these, the earth will become a jungle. Higher temperatures mean the oceans release more CO2 by Henry’s law, we get more evaporation and more rain and the deserts vanish. Huge plants and huge animals. Much as it was when all those plants laid down our coal and oil and gas reserves entirely from stored sunshine and rotted plant matter. Surely people should wonder how we came to have so much buried hydrocarbon? While people now talk about balance in their simple Bern model, grasses and shrubs and trees growing and others dying, they are not talking about the high CO2 world in which giant animals lived on giant plants. Our biggest land animals are now five tons. What sort of CO2 levels were around when 90 tonne animals roamed the planet in herds? They were not munching on alfalfa. More CO2, higher temperatures, more rain, more plants, bigger herbivores, bigger carnivores, more life. The Sahara was a jungle. Patagonia is still covered with millions of huge dinosaur egg shells. Surely the dinosaurs did not eat rocks? It was all paradise until early hominids invented the fern powered combustion engine and caused global cooling. Who said increased CO2 was a problem and how did they prove their case? The argument against change is absurd, especially from a species which has only been on the planet 100,000 years. The real danger is another ice age. You cannot live on a glacier in New York. You’re absolutely right TdeF. Satisfy the moisture, and CO2 requirements and maybe run the temperature up another 8-10° C then we would be able to grow bigger elephants. Much bigger elephants. Eighty million years ago, before the Dinosaur Destroyer splashed Chixulub all over the globe, there were the titanosaurs. 30 to 35 metres long, 7 metres tall at the shoulder and weighing in somewhere between 60 to 88 tonnes. Each. A bantam-weight titanosaur was about 40-50 tonnes. (There’s a list on the linked page. Have fun). These critters were herbivores so the forest they grazed must have had amazing regenerative properties. With a warm, very moist climate and CO2 over 1000ppm (nearer 2000ppm) they were in clover, so to speak. How much food per day would one titanosaur consume? What would a family group consume? Tonnes and tonnes. Why did the titanosaurs not only survive for over a 120 MegaYears but thrive? Because the conditions were right to grow plenty of food. Fast. It was the Dinosaur Destroyer which killed them. The ejecta thrown up into the stratosphere by the impact blocked the sunlight. The plants died and the dinosaurs starved to death. The thin layer of soot over the top of the iridium layer in the rocks marking the impact, suggests the world burned over a huge area. Almost all modern plants evolved when CO2 levels were c. 1000ppm or more. Why will they curl up their leaves, drop their flowers and die just because it gets a mere 2° C warmer? Just because the Grauniad says so? I think not. Back when they evolved it was probably 8-10°C warmer than it is now. The Titanosaurs were why T-Rex, the world’s largest predator, and the other huge allosaurs evolved. So why should we expect a disaster in more warmth? More moisture? More CO2? What’s the mechanism to cause that to be a disaster? These tiny green brains hear and read all this stuff, even see it if they take the kids to the Natural History Museum to see the dinosaur skeletons, but don’t put it together. The Grauniad writers can’t and don’t think. Natural History is all around them and all they can do is make pure MBE assertions without any evidence. MBE = Male Bovine Excrement. The largest herbivore the climate can support now is the African Elephant: a 4m by 4m by 4m midget. And the largest carnivore? Probably the Polar Bear—a couple of mouthfuls, if that, for a hungry T-Rex. The world has been there, done this, several times before. That’s what makes these predictions about crop failure if temperatures go more than 2°C higher than now so incredibly bad. Utterly Clueless. From reading the Grauniad article it almost looks as though the author has a macro key on their keyboard which outputs “Climate Change” every time it’s pressed and the author has to press at least once every second paragraph to be paid. Strictly speaking T. rex wasn’t the largest predator. Spinosaurus was almost twice as heavy. There were others e.g. Giganotosaurus which were slghtly bigger (about 9 times a polar bear). But it doesn’t matter as any one who writes for the Guardian considers any facts from before 1962 as non-existing. Hence their waffle as they repeat what they have been brain washed into believing. No criticism intended, it is just a case of you hearing over and over that T. rex was the biggest, baddest meanie. I know of spinosaurus and I agree with you. I used T-Rex because T-Rex was nice and big and everybody and their dogs had heard of T-Rex. Not only that, there are complete skeletons of T-Rex in the Natural History Museums. Yes there’s one of spinosaurus too, but the species is not commonly known. The other biggies, like Gigantosaurus, of the carcharodontosauri family etc, are reconstructed from skulls and a very few bones. Their structures are very incomplete. Most of these are named as being “about the same size or bigger” than T-Rex, but without more complete skeletons, size is a projection and really is unknown. I was playing it safe and going for visual impact. Your comment is not taken as criticism, so stop panicking. I do it, too. I wonder how popular T-rex would be under the name originally used (for a few bones) of Manospondylus gigas? Or the original name used by Henry Fairfield Osborn, of Dynamosaurus imperiosus? Osborn made a mistake confusing the bones discovered by Barnum Brown for 2 new species but covered his gaffe thanks to the paper describing T-rex being published first. Osborn was not prone to admitting any faults and was not one of those sensitive caring managers so popular in current literature. e.g. He summoned Barnum Brown one morning and informed him that there was a boat leaving for Argentina that evening at 11.30pm and that Brown was to be on it. Barnum Brown was and spent the next 18 months in South America. There’s always cooling to be had, and maybe some dimming. With all that you get short growing seasons or even none in Canada, N. Asia, N.Europe; drought in Africa, Asia, ME; big and unwelcome population movements while people enlist in armies for lack of other occupation. The wars and immigration crises just make themselves. A Bilderberger’s dream. Being reasons to love CO2. Attached link is to a well written paper on the benefits of increased CO2 on agricultural production. In any economic evaluation there is always consideration of positive and negative effects. Unfortunately Alarmists only project exaggerated negatives effect based on assumptions that feed into their models (which don’t have any basis in reality) and don’t take into account any positive benefits. I saw a testimony to a US senate committee by an economist who had taken into account the benefits of increased agricultural production in determining the price of CO2 emissions and his conclusion was that instead of carbon price of $20 – $30 a tonne for emitters, there should be a credit of $8/tonne. I cant find the link now. Hopefully some one else may find it. Of course it didn’t get any media response as it wasn’t preaching the current dogma. We need to continually not just oppose the falsehoods of the science, but keep pushing the economic benefits of increased CO2 . People (apart from inner city greens who are now living in an artificial reality world), as they become affected in the hip pocket ( loss of jobs, increased power process leading to increased costs for goods and services) will start revolting against the media, politicians who led them down this path to nowhere and the pseudo (political) scientists who have ridden the gravy train for their own short term career and finacial benefits. Pontifical Academy of Sciences agrees with the anti-CO2 mob! I don’t like being rude about the religious, but is it a surprise that the Pope believes a whole load of quasi-religious faith-driven nonsense? And it’s definitely no surprise that people whose life is centered around telling us that we are all on the wrong path is easily persuaded that we are all on the wrong path. The world is generally getting better. Far fewer people are grindingly poor, far more people are moderately rich. Far fewer people are starving and far more people are well-fed. Violence is down, air quality in Western cities is the best it has been for 150 years, and river quality is the same. But still large majorities everywhere believe everything is in fact worse. got 2MW of “wind and other” on the board today….never seen that before…. Amnesia PalaceChick is the “wind”. I think the CFMEU is the “other”. 2MW, you know, 0.025% of actual Queensland power consumption at that time. Could be test output from that huge monster mammoth wind plant on the Atherton Tableland, Mt. Emerald, 180MW Nameplate, so in reality 54MW, you know, 0.72% of Queensland’s actual power needs, so not far to go now till Queensland reaches that 50% renewable target. Just another 70 of those, at the rate of six of them each year, as long as they close down half their existing coal fired plants, something they have said categorically they will not be doing. Global agriculture and its ability to feed the 7.5 billions of humanity now, going on to maybe 10 to 11 billions before the global population slowly begins to decline in the second half of this century, is at far more risk from the activities of the criminally ignorant, fanatically anti-agriculture, anti-industry, anti-energy, anti -human western Greens than it will ever be threatened by any supposed global warming and / or climate change. The qualification here being the increasing chances that the dreaded and catastrophic Climate Change of the green watermelons and their running dogs in politics, the bureacracy and the media will not be a warming of the planet but a possibly sharp, potentially food production curtailing, potentially devastating cooling of the planet. If the short term outlook, say a half a century ahead for the global climate is cooling, then all bets are off as far as the world’s farmers are capable of continuing to feed mankind’s slowly increasing billions. If the world climate indeed becomes a cooling climate and if that cooling climate shuts down a considerable part of the far north continental food crop producing agricultural areas due to too short growing seasons for crops to mature and some hunger becomes the norm for parts of the humanity, then the witch hunts will begin for all those climate scientists, those politicians , those greens, those in the media who tried every trick they know of to shut down the very items that they claimed were going to create global climate change through a global warming trend that was supposedly to be due to humanity’s efforts to make life more comfortable for ourselves. The backlash against the global warmers and greens [ie; example ; attempting to globally ban the herbicide "glyphosate" ] won’t be the least bit pretty if the world begins to cool and food production is curtailed and pockets or hunger or worse, severe political instability due to the global warming / climate change / greens increasing attacks on the food producers of the world, begin to appear around the globe. The climate will continue to grow colder during the 1970s and early 1980s; then it will become gradually warmer again so that by 2015 we shall be back to where we were in 1960—no better; and after that it will start becoming colder again. In short, the outlook for the next fifty years is chilly. The shorter cycle may be the Wolf-Gleissberg cycle of nominally 80 years. Zharkova’s discovery of the solar dual dynamo from which is projected a reduction of sixty per cent of solar activity, or a Maunder type minimum, from 2030 to 2040, rather supports Dansgaard’s prognosis of “50 chilly years.” I’m not selling my wool shares! “They found, among other things, that temperatures have changed more suddenly and violently than had long been supposed; around 15,000 years ago, for example, Greenland abruptly warmed by 16 degrees within 50 years.” – from Dansgaard’s NYT Obit. There is always a willingness by the consensus to discuss remote past temps, CO2 levels, climate changes/ conditions etc. What’s downright dangerous is the unwillingness to discuss what ought to concern us most closely and urgently: radical climate change in the near past. Massive shift within the period of human settlements (eg Optimum and Storegga Slides a bit before 6000 BC) is not the elephant in the room: it’s the flaming brontosaurus in the VW. Kundhavi Kadiresan, the Asia Pacific’s United Nations Food and Agriculture Organisation assistant director general, said efforts to eliminate hunger had declined in the past year. Dr Kadiresan visited Australia this week to meet with the Federal Government and agricultural aid agencies. She said South-East Asia, which had once been an area making inroads to eradicating hunger, had witnessed the biggest declines recently. “But [a] recent report saw this part of the region did a good job in bringing down hunger. More than 40 million people were affected in South Asian floods in India, Bangladesh and Nepal this year. An estimated 1,200 people died in the floods. Dr Kadiresan said extreme weather forced people into hunger, particularly in rural areas. “These weather-related incidents are becoming very difficult, because the people who are vulnerable and just managed to come out of poverty, these kind of weather shocks can be really serious,” she said. Half of Bangladesh (population 163million) is less than a metre above sea level. What is amazing with the alleged rapid sea rise is that tens of millions have not drowned. However those who drowned were killed by Climate Change? How was that determined? How can the Climate Change gurus tell a Climate Change hurricane or tropical storm or storm surge or drought from a natural one? 3 Windmills will save us. Send money. The population of Kiribati is 115,000. That is 0.06% of Bangladesh. Still Kiribati gets Climate Change relief? Why? Kiribati is in urgent need of the funds – to build tourist resorts. And those private bungalows over the shallow water which rent for $1000 a night. You left out photo-voltaic cells and payments by power companies for supplying power to the grid over the unwanted midday period (only when there’s no cloud). The ‘weather-related issues’ in Mongolia couldn’t possibly have been the incredible cold they suffered that caused the loss of huge numbers of livestock? - if it’s flood, drought and warming, it’s climate change. - if it’s unseasonal freezing, frosts, snow, it’s natural variation. Of course, of course. Silly me to forget that. Efficient agriculture needs CO2, of course, as well as fertilizer, and….. potash. Fertilizer/Nitrogen, can be extracted from the air: Haber-Bosh process. Potassium is a different story. Potash is essential to agriculture. In a sense, it is a strategic mineral. China routinely manipulates contracts for Potash to affect market prices to their advantage because they need it desperately to feed their people. AU has large stores of potash. That’s a good thing. Farmers routinely burn their fields to release the potassium in the stalks/stubble back into the fields. CO2 is important. So are Potassium and Nitrogen. Someday, potash might be very important. When you burn a tree, the ash left is potash and calcium and other metals, sodium, magnesium, phosphorous. Trace elements which weigh nothing. Same with humans, except more calcium from bones. All life is made from CO2 and water. Tiny amounts of nitrogen too. I cannot believe people actually hate an element of the periodic table. Greenpeace banned Chlorine. That’s crazy and impossible. Climate Change is a science free zone. I thought that was about what they called organochlorines such as DDT, PCBs, CFC’s, dioxins, PVC’s and the transportation of chlorine gas (or liquified chlorine). I don’t think they’ve succeeded with the PVCs—they’re too useful. Trouble is, I haven’t seen any of the research which supports this essay. I’ve used DDT, PCBs, CFCs, and PVCs a lot and often. Oh dear, I must be about to die from fifty different cancers! The warming should not kill us of “per se”. If we can manage water resources effectively we should be able to adapt to a somewhat warmer climate. It is this talk of global cooling though (that is not getting much coverage or air time at present because nobody has figured out how to gain financially from taxpayers for that yet) that is concerning. Like many comments states above, cold snaps at the wrong time can have a devastating effect on crops. The alarming thing about the graph above is that we are globally consuming more than what we can store (population growth) and that makes us extremely vulnerable. But building solar powered power stations or windmills is not going to do anything for this. Bjorn Lomborg is on the money when he says we need to adapt and not try to mitigate. Agreed. When a train is coming, you may remain upon the tracks or get out of the way. The hippopotami frolicking in the North African rivers, streams and lakes among the lush forest which grew across what is now Morocco, Algiers, Libya, Tunisia and Egypt 8000—3000 years ago would quite possibly agree with you that management of the water resources was important. After all, the countries I’ve named are now mostly deserts, semi-arid to arid landscapes. Bjorn Lomborg is not liked because he talks hard sense. We have less than ten years to get our act together before the cold arrives. Of course, we’re not doing it. The melon heads are still trying to push their pseudoscientific warming palaver. Oh yes, it was about 2-3 ° C warmer then. Is there anything untoward that climate change won’t make worse? The answer is for some fowl reason. Ireland threatened over increased agricultural production! Irish farming and food sectors need to address urgently “a gulf between rhetoric and operational reality” in reducing carbon emissions, according to the European Commissioner for Agriculture Phil Hogan. In a blunt message on failure to reduce emissions and meet EU targets, Mr Hogan said the latest EPA figures on Irish emissions showing a 2.7 per cent increase in agricultural emissions last year were “sobering”. He warned that Ireland was sleepwalking to fines for not delivering on climate commitments. Failure to reduce emissions went beyond farming; there was also a need to reduce dependence on fossil fuels and scale up adoption of renewable energy sources. “It’s little consolation that emissions are growing faster in the energy and transport sectors,” Mr Hogan said. Mercosur and EU negotiators will meet for the next number of days in Brussels with the EU expected to offer to include an(additonal?) annual import quota of up to 70,000 tonnes of South American beef as part of the deal. The EU is an unelected dictatoial beauracracy. Britain woke up. How long before it falls Apart? The EU is just a collection of bully boys. When there are still hungry people in the world, how dare they bully Ireland and other nations for the production of more good food. This news incenses me…adequate words fail me. Teresa May…for Heaven’s sake stop messing about and get Britain out of this appalling set-up. Apparently, socialism failed as a political endeavor to remake the world. That said, Politicians have learned from Socialism and Fascism “the power of the great lie”. Methinks ordinary people have a deeper grasp of reality than the pretenders. Remember who works for whom. Reward those who defend your Liberty. Punish those who encumber it. I really have trouble getting my mind around the fact that the EU apparently places far more importance on reducing CO2 than it apparently does on food production as with the Irish and Dutch and etc above. At least they are world leaders in this emphasis on reducing CO2 as compared to increasing food production. Food production or lack of throughout the entire history of mankind been one of or perhaps the only factor that has had a very limiting effect on mankind’s numbers and on his societal and technological progress down through the ages. But maybe, just maybe we are beginning to see the end game of the EU in the form in which it exists today. And not before time either according to a lot of people. European Commission President Jean-Claude Juncker would like the EU executive to have more control over the Eurozone in the future. But member states aren’t eager to give up control. That great EU protector of democracy, the British people are leaving and the EU commission and bureacracy in Brussels is becoming ever more dictatorial and is allowing less and less expression of nationa interests amongst its member states. And So I think we are close to seeing the end of the European dream , the great nation state of Europe, destroyed as is always the case by the belief that some men and saome womenbelieve themselves to be infinitely more entitled to rule some 45550 million people than any body else let alone allowing th at450 million numbers of the proletariat who are far. elow them in status to have any say at all. The more 90-degree days a fetus or infant endured, the lower his or her earnings in adulthood. Even if countries take moderate action on climate change, by the end of this century, Phoenix is expected to have an extra month of days above 95 degrees Fahrenheit, while Washington, D.C., is expected to have another three weeks of these sweltering days, as the Climate Impact Lab and New York Times reported. A new study suggests that even days that are an average of 90 degrees Fahrenheit, or 32 Celsius, might have long-term, negative impacts on developing fetuses. The stress of the hot weather might show up as reduced human capital once those fetuses reach adulthood. What’s more, the study used data from the 1970s, when more and more people were installing air conditioners in their houses. The researchers found the difference in earnings went away in areas where most people got air conditioners installed. Now a new study by researchers at Stanford, the University of California, Berkeley, and the U.S. Department of the Treasury suggests that even short periods of extreme heat can carry long-term consequences for children and their financial future. Specifically, heat waves during an individual’s early childhood, including the period before birth, can affect his or her earnings three decades later, according to the paper, published on Monday in Proceedings of the National Academy of Sciences. Every day that temperatures rise above 32 ˚C, or just shy of 90 ˚F, from conception to the age of one is associated with a 0.1 percent decrease in average income at the age of 30. Diffenbaugh said the study is a breakthrough for climate researchers who have been struggling to pinpoint the impacts of melting Arctic ice. “Being able to isolate the effect of melting sea ice on the atmosphere and the ocean’s response — and how it impacts precipitation in California — that is a big step forward,” he said. Other than cutting and pasting excerpts from an article from the LA Times, what is desired to say? There is no position, no claim, no defense, no objection, no news, no facts, nothing. Regurgitation. Meaningless post. Or did I miss something? Thanks for that link Pat. CHICAGO — Former President Barack Obama says cities, states and nonprofit groups have emerged as “the new face of leadership” on climate change. He briefly spoke Tuesday to a summit of mayors from around the world gathered in Chicago to address concerns about climate change since President Donald Trump rejected the Paris climate accord. The mayors signed a charter that echoes portions of the 2015 Paris agreement. Speaking at an invitation-only event organized by a network of communications professionals known as the Napoleons, Obama did not mention President Donald Trump, who announced his withdrawal from the landmark global deal in June. ever notice how often FakeNewsMSM report some anti-Trumper didn’t “name” Trump, while proclaiming it was all about Trump…as if we didn’t know! Out of work ex president, ex community organizer, desperately seeking relevance as his legacy dissolves before his eyes. Must be very difficult to be so young and have so many years remaining to be reminded of how pointless and irrelevant his entire lifetime has been. If it weren’t for socialism and racism, he’d have no audience at all. Truly a sad thing. Perhaps Chess or Checkers in the Park might fulfill the need for relevance. Perhaps not. Who cares? One meeting on the brief Paris trip, however, stood out – when Obama acted as keynote speaker at a regular summit of a rather obscure organization with a striking name – Les Napoleons, who, according to French media, “staged a coup” by wooing Obama to Radio France’s headquarters near the Eiffel Tower. Les Napoleons, which prides itself as an “innovative communications network” for leading players in business, media and culture, was established in 2014. Before Obama dropped by, it was largely unknown to the general public. The network numbers just 1,500 people, self-styled “academicians” from the media, technology and finance industries, including 500 who are active. The club’s co-founder, Olivier Moulierac, admitted to the French newspaper Le Monde, that Les Napoleons had been courting Obama for three years – well before he handed over the reins to Donald Trump. French satirical magazine Le Canard Enchaine last week said Obama would be paid as much as €400,000, claiming a sponsor of the group, French telecoms group Orange, was to foot the bill. The report, however, was dismissed by Orange CEO Stephane Richard, who said that he was not aware of the sum, since Orange was not the event’s organizer. The amount, whatever it is, would be paid by the group’s other sponsors, he added. An anonymous source close to Richard told left-leaning newspaper Liberation that all the group’s partners chipped in to afford Obama. The meeting between the two was a part of the former US President’s tour around the globe, though it went largely unnoticed by the media. Former US President Barack Obama met with Chinese President Xi Jinping merely weeks after Obama’s successor as the American leader, Donald Trump, visited China. Obama and Xi were photographed smiling and drinking tea at the Diaoyutai State Guesthouse in Beijing and were quickly dubbed as “veteran cadres,” the term generally used to refer to retired Chinese Communist Party officials. Although Obama shifted his tone from being critical of China’s human rights record to a more conciliatory stance during the latest visit, “appreciating China’s development achievements,” the exact purpose of his visit remains unknown. Thanks Pat; Have to say I am totally pissed off with the Obama reteric; why do so many people rush to listen to this man? Me, I heard enough of him whilst he was in office. See this for what I think of climate change. A fool by any name is still a fool, whether you dress him in an expensive suit and put him in high office or meet him loitering on a street corner. They all are alike, negligent, ignorant, selfish and looking for something they’ll never get, the satisfaction of doing the right thing. A fool by a name (Australia) is still a fool. For whatever reason, the nation as a whole, not just the politicians, have decided to commit economic suicide by refusing to build even one new coal fired power station while hundreds are being built all over the rest of the world. Go figure. Oh, don’t place all the blame on the politicians. Much of it rests on the voters. It’s bizarre that Australia has vast deposits of coal, gas and uranium and export it for others to make cheap electricity with but we’re not allowed to use it ourselves. Well if we won’t use it for ourselves to build this nation instead of destroying it then someone else will come over and use it to build this nation for their purposes under their flag. It’s only a matter of time. No prize for who that will be once the US declines far enough and ceases from being the dominant world power. China has a 22,000 kms of border with 14 countries, nation states in their own right. You can lay odds that at least half of those 14 countries have been invaded and /or occupied by China during past centuries and the locals haven’t forgotten and most of the othe half are careful with their words but have a very jaundiced out look on any future Chinese hegemony of Asian and SE Asia. China will inevitably run up against the ‘Limits to Power’ that every Empire that ever existed has come up against and which sooner or later has stopped them and their plans for expansion in their tracks. Exacerbated in the Chinese Dragon’s case by the historical Chinese Han’s xenophobia against any peoples and / or races that aren’t Han Chinese. But of course as we all well know. “This Time it is different isn’t it.”! Yes empires always come and go but it takes time. So much time in fact that people forget and think it will never happen again. How wrong they are. The Western empire will decline and crash one day, that’s a given. What replaces it is really uncertain at this stage as there are at least two possibilities. Oh, don’t place all the blame on the politicians. Much of it rests on the voters. All of it rests on the voters. Their choices at the polls determine who goes into public office. So the voters are the fools you meet on street corners. Perhaps not all of them, but apparently too many to overcome. The gathering was part of the North American Climate Summit hosted by Chicago mayor (and former Obama Chief of Staff) Rahm Emanuel. It’s the first of the kind for the city. Oh Bummer a speaker and Clover More an attendee. The conservative Heritage Foundation might have just previewed the Trump administration’s arguments against climate science. U.S. EPA appears to be close to unveiling its program to question mainstream research on global warming, referred to as a “red team” exercise, and several candidates for that role cast doubt on the extent of climate change at the Heritage Foundation yesterday. Coral reefs, including Australia’s Great Barrier Reef, will have died and dissolved away by 2100, Sir David Attenborough will say in the last programme of his Blue Planet II series, to be shown next Sunday. He will warn that CO2 emissions are making the oceans increasingly acidic. As a result coral and seashells dissolve faster than sea creatures can build them, spelling destruction for reefs across the world. In the final episode of Blue Planet II next Sunday, Sir David tells how increased levels of carbon dioxide in the sea will kill all coral, including Australia’s Great Barrier Reef, by 2100. The Lloyd’s market has paid almost $2bn (£1.5bn) in claims for natural catastrophes so far this year. It could turn out to be one of the costliest years on record for natural disasters, a fact that will no doubt reinforce determination to tackle this growing problem. We know that the frequency and cost of natural disasters continues to rise, with direct losses over the past decade estimated at $1.4 trillion globally. Michael Bloomberg with about 50 billion dollars is the person behind the news organization of that name. He is a co-AGW-religionist with Al Gore. However, Bloomberg ‘the publication’, in this case took the information from the Potsdam Institute for Climate Impact Research (+others). None of these folks ever get anything right. Just like atoms, they make things up. U.S. farmers constantly improve their procedures and adjust plantings seasonally. Further, researchers are continuing to generate better plants** and growing techniques. The gloom & doom projections in the reports cited in this post will be proven false. **New apple verities from OZ, Canada, and elsewhere are just getting better and better. Just a day after the Chicago Sun-Times reported that the feds are going to examine the placement of the Barack Obama Presidential Center on a prime chunk of public park, neighbors are getting organized to save their green space. The group has put out an open letter to the Foundation, voicing its concerns. Overtly, it seems to think it has a leg to stand on because the Plaisance is on the National Register of Historic Places. The undercurrent in the letter seems to be that they don’t want the Obama museum sucking up part of Jackson Park, either, but know there’s not much they can do about that. Just as everyone assumed this project was a foregone conclusion, things are starting to look interesting. Read the open letter from Save the Midway below…. We are concerned citizens working to save the Midway Plaisance from development. The City of Chicago and the Obama Foundation intend to build a 2-story above-ground parking garage and outdoor bus staging area on the Midway Plaisance east of the Metra tracks. 2. The Midway Plaisance is on the National Register of Historic Places. 5. In addition to the loss of green space, there will be increased traffic, idling buses, and air, noise, and light pollution. “As a Founder and former National Co-Chair of the National Association for Olmsted Parks , I strongly urge former President Obama to honor his own environmental legacy and reconsider the heinous destruction of one of the finest examples of Frederick Law Olmsted’s work. The Midway belongs not only to the people of Chicago but also to the people of the nation. It is part of the historic fabric of public open spaces of which we are all stewards. Starting this week, the evolving—and at times controversial—plan to build the Obama Presidential Center in the middle of Jackson Park will come under the review of the federal government. The additional oversight is triggered by proposed changes to Jackson Park which is included on the National Register of historic places. The 1871 Frederick Law Olmsted and Calvert Vaux-designed greenspace was added to the list in 1974. As proposed, the Obama Center’s multi-building campus will replace roughly 20 acres of park space, including a number of historic trees. Developed in tandem with a merger between Jackson Park’s golf course with the course at the South Shore Cultural Center, the plan looks to close stretches of Cornell and Marquette drives as well as construct a new parking structure in the center of the historic Midway Plaisance. Please, please do not inform the President of the United States that some of the agencies under his administration have something to say about the location of the Obama Presidential Center. There have been, for several years, many comments by the talking (and writing) heads of political wisdom in our country about the “Politics of Vengeance” being seemingly practiced by the present residence of the White House against its most recent past resident. The site proposal for the Obama Presidential Center also includes plans for a PGA-level golf course, a controversial move that would combine the Jackson Park and South Shore courses . Juanita Irizarry, executive director of Friends of the Parks, found the session informative, but with no concrete answers as to how the proposed golf course fits into the review process, she’s concerned the issue will slip under the radar. According to Climate Change™ cultists there are absolutely no possible positive outcomes from human CO2 emissions, I have never seen them admit to a single positive, not one e.g. :’… more CO2 means more weeds and less nutritious crops …’. Yet historical evidence shows a cooler climate, for instance year without summer (1816), brings widespread famine. The obvious conclusion must be that by an amazing coincidence the global climate ~1950, just before humans began to emit CO2 in significant amounts, had reached perfection. Record crops of wheat, rice, maize (corn). That’s a lot of food. How long until we see ‘Climate Change Causes Obesity’ in the Guardian and Teen Vogue, etc? That could catch on in certain circles. They could jog to the rallies to fight climate change-caused weight gain. And anyone who gained weight, especially if extreme or catastrophic, could blame it on the climate. variabilities revealed in history’s record? one ‘n all… Oh ye soote cee-oh-too! In England the word corn means Wheat, oats and barley. It does not mean Maize. Climate change is sending people to bed hungry ! Turnbull is running second for “Prat of the Year”! I’m still making up my mind, there’s so little to choose between them. An excellent site to see for yourselves what science says about how plants [ and oceans and etc ] respond to increasing levels of atmospheric CO2 is the CO2 Science site. There is a listing of recent research papers on the opening page as given by the URL above. The DATA provided on this site is taken from research projects and papers from around the world. For actual responses of plants such as ‘Wheat” to increased CO2 just click through DATA in the menu at the top and then select from the alphabetical listings to find the plant species and types you may be seeking information on. Even when you get to the tables of data of a species responses to changing CO2 levels species then clicking that species in the tables will give you the papers and researchers on which the data for that plant species shown is based. For a CO2 level of 1000 ppm of CO2 , ie 600 ppm above the background level of 400 ppm, the increase in Wheat’s biomass, which does not neccessarily reflect yields of grain , amounts to a 63% increase in Biomass. Not shown here is that there are quite large variations in the Wheat’s varietal responses to increasing CO2 [ there are literally thousands of varierties of mankind's main food grain crop, Wheat ] as has been observed in the CO2 open field crop ring experiments ‘FACE” Free Air CO2 Enrichment experiment . What have we learned from 15 years of free-air CO2 enrichment (FACE)? A meta-analytic review of the responses of photosynthesis, canopy properties and plant production to rising CO2. Haven’t the Armies of the “Kingdom of Trolldom” been paid of late? We are getting the odd half hearted SkS funded gorilla gerbil , pygmy guerilla attacks but nothing that is being pressed home anymore. A serious failure of Trolldom generalship methinks if they can’t organise themselves better than that. As a Newspaper, the Guardian is obviously struggling with the truth. perhaps it would be more suited to advertise itself under the “fictional” section of a daily. Recently I also saw the BBC advertising why readers should trust it as a media source. Thankyou jo for posting this comparison it truly illustrates the problem with media bias and those MSM sources indulging in CAGW misinformation. Reputably 25% of The Guardian print run is taken by the BBC for its staff. Perhaps so they can read the BBC positions vacant adds. Or is it that the BBC adds supply 25% of The Guardian’s revenue? In either case it is a (gay) marriage made in He…..?